Colorado adventure and hot springs destinations recently formed the 720-mile Colorado Historic Hot Springs Loop, which showcases a variety of hot springs pools. I’ve personally experienced Ouray, Pagosa Springs, and Steamboat Springs and heartily recommend any of Colorado’s hot springs for relaxing after a day of play and exploring. Home to over 500 miles of four wheel drive heaven, it is no wonder that many consider Ouray in the summer to be the “Jeeping Capital of the World.” In winter, Ouray has the ultimate climbing experience at the Ouray Ice Park, home to more than 200 ice and mixed climbs where novices and experts are all welcome to learn a new sport or master their skills. Orvis Hot Springs, located just north of Ouray, maintains electronic-free soaking areas that encourage guests to unplug and unwind. Visitors can book a room on the property or bring along camping gear for a truly authentic night under the stars. 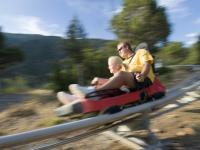 In the summer, Glenwood Caverns Adventure Park is a mountain-top theme park that offers tram and thrill rides along with cave tours. In winter, guests can make their way to Sunlight Mountain Resort’s Babbish Gulch for an afternoon of snowshoeing on a Nordic trail system. Relax, restore and rejuvenate at Glenwood’s newest wellness destination, Iron Mountain Hot Springs where 16 soaking pools filled with pure, hot, mineral water are located on the bank of the Colorado River. During the summer, the mighty Arkansas River flows through the heart of Chaffee County. For first-time rafters, families and those who enjoy canyon scenery and wildlife, Brown’s Canyon, is one of the Arkansas River’s most popular sections. 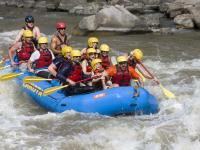 Consisting of mostly Class 3 rapids, riders should be prepared for splashy, bumpy fun. 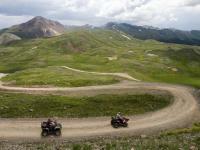 In the winter, snowmobiling to the top of Cottonwood Pass near Buena Vista, brings riders to the Continental Divide. At 12,000 feet above sea level, visitors are surrounded by numerous 14,000 foot peaks and glistening Rocky Mountain snow. For a private experience, Creekside Hot Springs Cabin offers a vacation rental home with its own secluded soaking hot springs pool that is fed by the Mount Princeton geothermal aquifer. Surrounded by over 3 million acres of national forest and wilderness areas, a hot air balloon ride in the summer with Rocky Mountain Balloon Adventures excursions allows guests to float peacefully while taking in the expansive views. From November to April, visitors and locals alike flock to Wolf Creek Ski Resort to ski and ride “the most snow in Colorado,” with an average of 430 inches of natural (not manmade) snowfall per season. The Springs Resort & Spa is located on the banks of the San Juan River in downtown Pagosa Springs. Offering 23 naturally hot therapeutic mineral pools and a mineral water lap pool fed by the world's deepest geothermal hot spring. 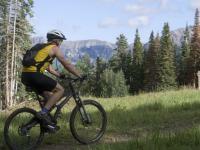 During summer and fall, experience downhill mountain biking at the Steamboat Bike Park where a bike access ticket takes guests up the mountain via the Steamboat Resort gondola. More than 50 miles of free ride and downhill terrain for all abilities make this spot a haven for mountain biking aficionados. In the winter, spend the day Nordic skiing, tubing or fat biking at Howelsen Hill Ski Area, the oldest ski area in continuous use in Colorado, operating since 1915. Strawberry Park Hot Springs is nestled in an aspen grove about 15 minutes from town. The natural spring water and stone pool surrounds offer a rustic and rejuvenating experience.